Computer programming is a science, and also an art. Coding using Scratch makes it more creative and funny. It provides an easy-to-use and powerful environment for kids to explore various functions of digital devices, and create all kinds of great works, for example, animations, arts, games and stories. During the process of learning and playing, Kids are not just consuming what’s given to them, but also taking initiatives and making amazing creations. In the world of coding, the potentials are far beyond our imagination. Different from many other books, this book has adopted a more intuitive and pictorial style to teach kids how to use Scratch to create great programs, with little help from adults. It has full picture and step-by-step guide for every project, with sufficient tips and guidance for kids to experiment more based on what they have learned. Building program has become as simple as building LEGO® models. It’s recommended for kids between age of 8 ~ 16, however, anyone could learn to code by simply following the instructions. 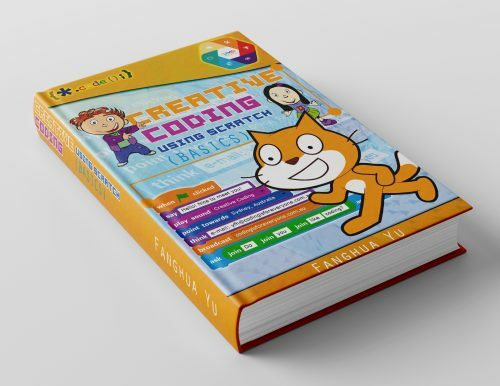 There are 14 coding projects included in this book, organised based on their levels of difficulty, and each one can also be used separately. If you would like to read free chapters, or want to buy a paperback book, please feel free to contact me via email. This entry was posted in Events and tagged Coding, Resource, scratch. Bookmark the permalink.